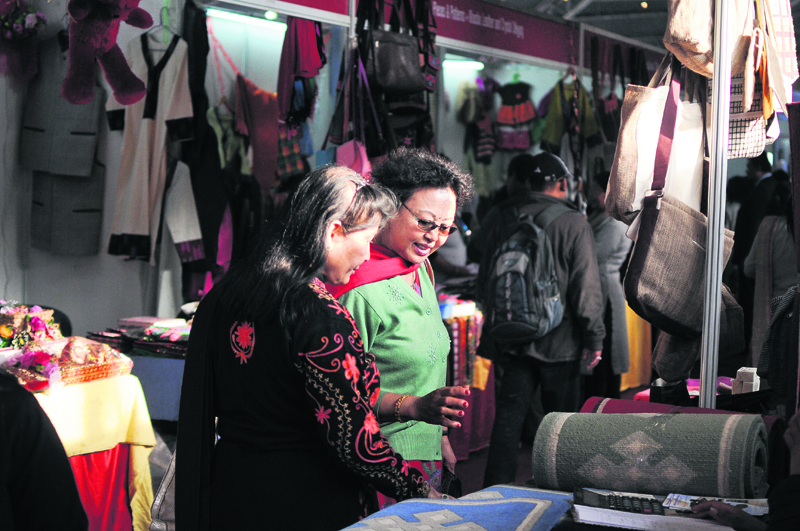 Visitors look at products at a stall in the 2nd International Women’s Trade Expo being held at the Army Officers’ Club in Kathmandu on Wednesday. KATHMANDU, Feb 15: Women entrepreneurs participating in the 2nd International Women's Trade Expo have said that starting a business enterprise and giving continuity to it was a difficult ordeal. They also complained that the government has not taken any initiative to help them and resolve the problems that they are facing. Buddha Maya Magar, an entrepreneur based in Okhaldhunga, said that women entrepreneurs like her were facing difficulty in taking their products to the market. “The market (district headquarters) is very far and there are not sufficient vehicles. Also, we have to pay huge amount of money to import raw materials from other districts,” she added. Hailing the initiative taken by the Federation of Women Entrepreneurs Association of Nepal (FWEAN), Magar said that events like these give the much-needed exposure to women entrepreneurs. “The market in Kathmandu is very big. If it were not for the expo, we would not have been able to promote our products in Kathmandu,” she added. Similarly, Chameli Magar, an agriculture technician based in Dhankuta, said shortage of water was affecting women entrepreneurs involved in agriculture sector. “Agricultural output will increase significantly if the government solved the problem,” said Magar. The 2nd International Women's Trade Expo is being organized by FWEAN with the aim to encourage women entrepreneurship and promote their products in domestic as well as international market. The expo has more than 100 stalls showcasing products from countries like Bangladesh, Afghanistan, India, the Philippines and South Korea, among others. According to the organizers, handicraft items, organic agro products, electrical products, food items, ornaments, decorating items, ICT products, among others are showcased in the expo.